George Graham reviews William Bell's' "This is Where I Live"
There has been quite a healthy revival of interest in classic soul music, considering the number of younger performers who are adopting the style, most of them not yet born during the heyday of the music. I supposed this is understandable given how today’s computer generated and processed commercial pop is so completely devoid of any soul or honesty. There have been some impressive artists emerging in recent years who get the music right. And there are still some of the original artists around who are doing more than playing in nostalgia shows and PBS fundraising specials. This week we have an absolutely first-class album by one of the real veterans, who probably is known better for his songwriting than a performer, but he is in great form. It’s William Bell, whose new release is called This Is Where I Live. William Bell is best known as the co-composer with Booker T. Jones of the blues classic Born Under a Bad Sign, originally popularized by Albert King, then by Cream with Eric Clapton, and covered by hundreds of other artists since. It’s also a staple of just about every local blues-rock band. Now 76 years old, Bell first started recording in the late 1950s as a member of the vocal group the Del-Rios, and in 1961 was signed to Stax Records where he became one of their stable of artists in the time before Otis Redding joined the label. His first Stax album was in 1967. He became a prolific songwriter, penning songs like You Don’t Miss the Water, Everybody Loves a Winner and I Forgot to Be Your Lover, which were covered by artists ranging from Billy Idol to Carole King to Kanye West. After his years with Stax Records, Bell moved to Atlanta and founded a record label called Wilbe Records, and has been releasing an album every few years. Now Bell is back on the rebooted Stax record label, which has also signed other performers who fit into the soulful Stax sound. The new album, This is Where I Live, was produced by John Leventhal, who has worked with people like Roseann Cash. Leventhal plays a prominent role, co-writing the new material with Bell, and playing most of the instruments on several of the tracks. With this kind of music, which relies so much of the organic sound and interaction of the band members, it’s surprising that it would be constructed this way with all the overdubbing, but unless one knew that in advance, one would be hard pressed to tell. It is definitely a classy album with a lot of soul and great, classic style arrangements in the Stax tradition, though the album was recorded in New York instead of Memphis. There are some additional horn and string players, and occasional guest drummers, but it’s mainly just Leventhal and Bell. The album consists of mainly new Bell-Leventhal songs, but there is a new version of Bell’s classic Born Under a Bad Sign and a cover of a song by Jesse Winchester. 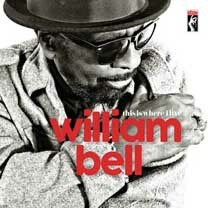 This Is Where I Live, the new album by venerable soul singer-songwriter William Bell is a real gem. Bell draws on the classic elements he helped to form, and takes them to new heights, in an album that is the epitome of the classy, soulful, Memphis style popularized on Stax Records, for which Bell is now again recording. Every one of the songs on the album can be used as an object lesson on how to do great soul music, in a style which that is full of authenticity and honesty, in addition to Bell’s great vocal at the age of 76. Producer John Levental was very much a part of this project, with his co-composing most of the songs with Bell, and at times playing most of the instruments by overdubbing. Our grade for audio quality is an A-minus. The sound is clean and warm, the mix is very good, and fortunately, there are no attempts to imitate the analog defects of the old recordings, which a lot of younger artists are doing. We’ll deduct points for the dumb volume compression designed to make the album sound louder. It undermines the ebb and flow of the music, and serves as a reminder of how much punchier the old recordings were before the loudness wars started taking their toll on pop music. There are quite a few younger artists who are dedicating themselves to reviving the classic soul sound. William Bell has been doing this for over 50 years, and he’s still the real deal. This is far and away the finest contemporary soul album to come down the pike in a long time.